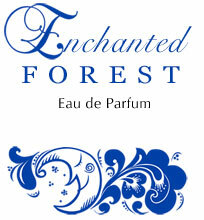 A poetic Hohloma style (one of the old Russian painting traditions) has been chosen to warmly invite you to Enchanted Forest. The style was developed by iconographers, so-called Old Believers (old Russian Orthodox Church), who ran from persecution during the church reformation by Peter the Great, to hard-to-reach regions behind the Volga River. There they tried to make a living by adapting their art of painting icons to the decoration of domestic appliances. They traded their works at the big market in the Hohloma village. People loved the rich curly style and readily traveled from remote places to buy beautiful spoons, cups, bowls, toys... They named the style of painting "Hohloma." Thankfully, Hohloma gives an artist many ways to express his or her imagination. 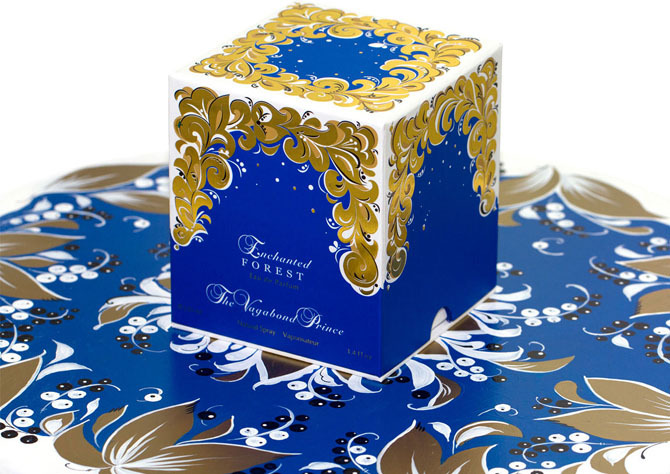 Enchanted Forest was painted in the festive "Kudrina" which Hohloma artists used only for gifts on special occasions—a laborious way of planting magic branches from the golden background. 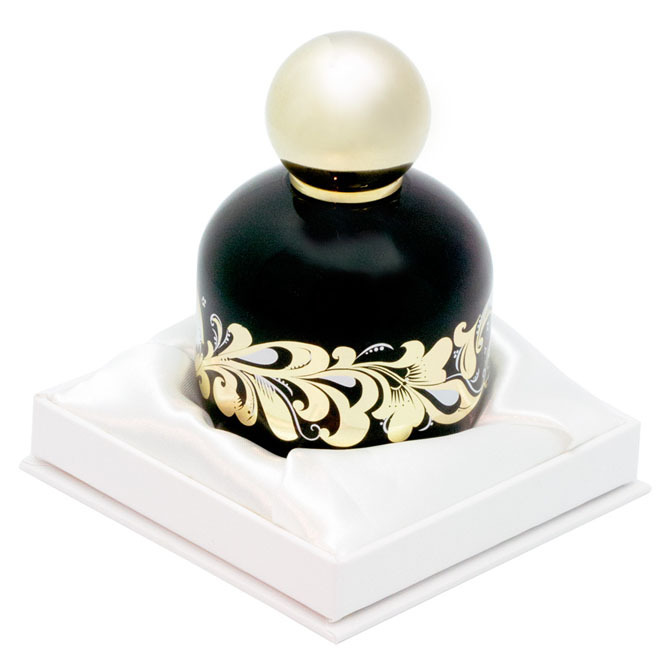 The round, glossy flacon is made of black opaque glass, to resemble the blackcurrant berry. A golden pattern of Hohloma grass is wrapped around the bottle. 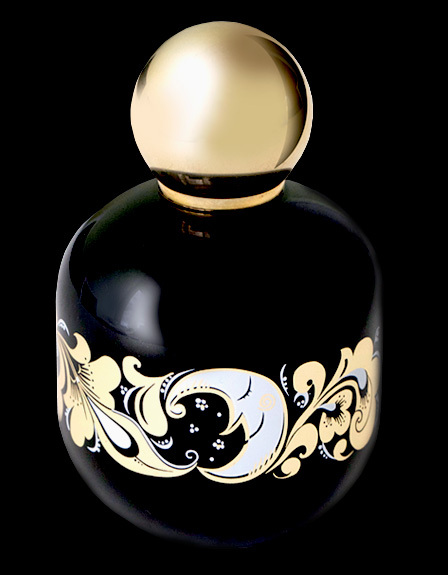 It was designed exclusively for this fragrance by the artist, first painted by hand and then printed on the bottle in shiny gold. Two symbols—a sleeping dove (silence) and the moon (fairytales, the mystery of the night)—are included in its tendrils. A remarkable thing about Hohloma is that it is not painted—it grows under the brush from a magical seed which is hidden somewhere in its pattern. 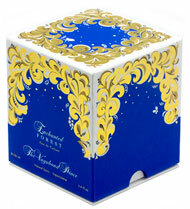 The box is lavishly decorated in golden Hohloma tendrils, representing the enchanted forest. It embraces the deep blue sky with its curling branches. The sparkle from a shooting star and silhouettes of the tiny night butterflies, resting on its branches, play little melodies on each side and easily fly into your imagination. 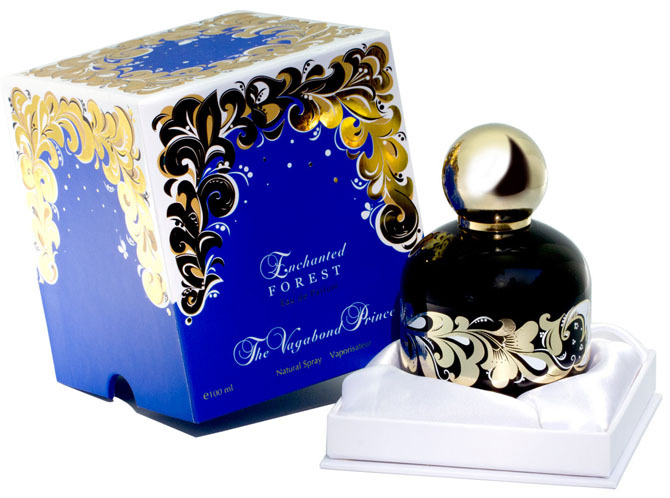 Elena Knezhevich, a co-founder of Fragrantica, has loved to draw and paint for as long as she can remember. Academic education in art, curiosity and the fortune to have talented friends have contributed to her development as an artist who is happy with what she does. Decorative painting is a very cozy, poetic and functional branch of the visual arts. "I love that artists used what they had available—simple products of wood and ceramic, sometimes metal or glass—and turned them into very beautiful things which were warmed by their spirits." "I discovered folk painting styles thanks to the artist from San Diego, Marianna Gorelova. Marianna is an extraordinary person: a physicist, a professor, who changed her occupation so drastically, listening only to her true passion that was calling out from the crest of exact science. She is a merry person and teaches us to transfer a good mood to every piece we create. This sparkle will go further..."